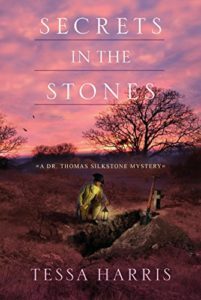 This is book six in the Dr. Thomas Silkstone Mysteries, which are the exploits of an American anatomist in 18th century London. I had read book two last year, and somehow didn’t realize this one was four books after that already. Still, I was able to pick up the threads of the series without too much effort again. It begins with a duel between Thomas and another man, over the affections of Lady Lydia Farrell, whom Thomas hopes to marry. She has been through some trauma, and her father is standing in the way of their plans to be together. So it’s no surprise when said father turns up dead that Lydia becomes suspect number one in the murder. Thomas of course is quick to look for clues to prove her innocence, and the story moves along into the investigation. Thomas has few clues to go on, but the autopsy reveals that the victim’s throat was slashed by what appears to be a ceremonial Sikh dagger from India. It soon becomes clear that this death relates to Lydia’s first husband, who had spent time in India. There is a mythical diamond involved, a search for a treasure map and old grievances that someone is seeking to bring vengeance for. The cast of characters is varied, and there are enough twists in the plot to keep you guessing. One thing that made me twitchy was in regards to Ms Harris’ over repetition of a certain phrase. Thomas is staying with his mentor, and whenever the two of them are having a conversation, the older man is continually referred to as “the older anatomist”. I think I counted five times on one page of dialogue where she used the same reference to indicate who was talking, rather than just have the dialogue flow. That was in conjunction with using the term to describe the man – we already know who he is! It’s not a bad read – just be warned, some of the details of the autopsies are rather graphic, along with some of the descriptions of the various deaths that occur. The romance is nearly non-existent, as the couple is kept apart for one reason or another for most of the book. The ending seems to wrap the series up, so I’m not sure if there will be another one to follow. Share the post "Diamonds and death"